Bobby Duncan you absolute legend! Our U23 striker hasn’t had to try hard to endear himself to Liverpool fans. He’s scoring goals for fun at youth level and he’s already got the privilege of being Steven Gerrard’s cousin. Which is crucial actually. After a game that was filled with references to Gerrard’s slip way back in the 2013/14 season, the pre-match noise was all about whether we could overcome those daemons. Ahead of the game, Chelsea’s official club account tweeted the Stevie G slip and Demba Ba’s resulting goal with the supposedly “cheeky” and “funny” caption: “Did someone say Liverpool v Chelsea? 😉”. Not really necessary and definitely tempted fate with that kind of taunting. There was a slip in the end though, as Andy Robertson lost his footing but thankfully there were no negative consequences. The only echo of that day five years ago was that the scoreline was the same – except this time, it was the Reds with a 2-0 victory! 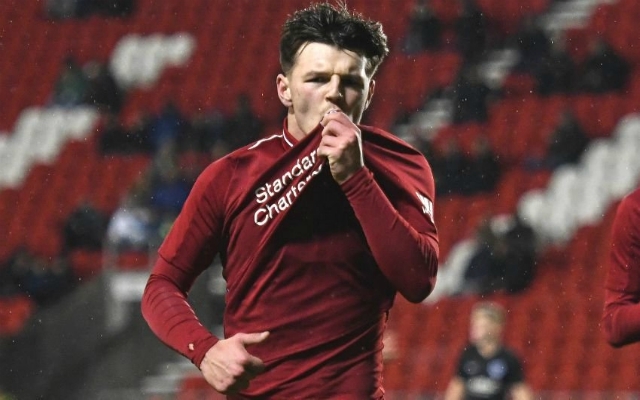 The 18-year-old showed some classic Scouse humour and banished the daemons with a simple, tongue-in-cheek tweet wishing them a safe trip back down to London. Duncan came through with the perfect response to Chelsea’s pathetic taunts – the other being Mo Salah scoring a goal of the season contender to get us those three points and take back top spot.